This article bolsters a previous one where we examined efficient markets and sports betting. We defined an efficient market in sports betting as one where the market price is equal to its true value. In the case of college football betting, the market price is the betting line and the true value is revealed with the actual results (of any given game). Studying the opening and the closing betting lines is of particular interest, in part because many professional bettors feel compelled to bet games earlier in the week, presuming earlier betting lines to offer the more inefficient market. (One would want to buy into an inefficient market because market inefficiency means “assets” are mispriced.) It is our contention that behavioral economic principles pertain to sports betting markets- namely, that people have a tendency to overreact. As a result, professional college football bettors can discover inefficiencies in closing betting lines. In this article, we introduce three more suggestions of greater efficiency in opening betting lines. For this article, when considering spread bets, we studied 7,803 college football games from 2005-2014 (10 seasons) for which we had point-spread betting data that included opening and closing betting lines. When considering Totals bets, we studied 7,522 college football games from 2005-2014 for which we had Totals betting data that included both opening and closing lines. Knowing that the sports bettor should want to buy into an inefficient market, we queried which betting line (the opening or the closing) had more perfectly-priced assets. In other words, we sought to learn which betting line resulted in more pushes (since a “push” is a tie, which means the betting line was identical to the actual results). 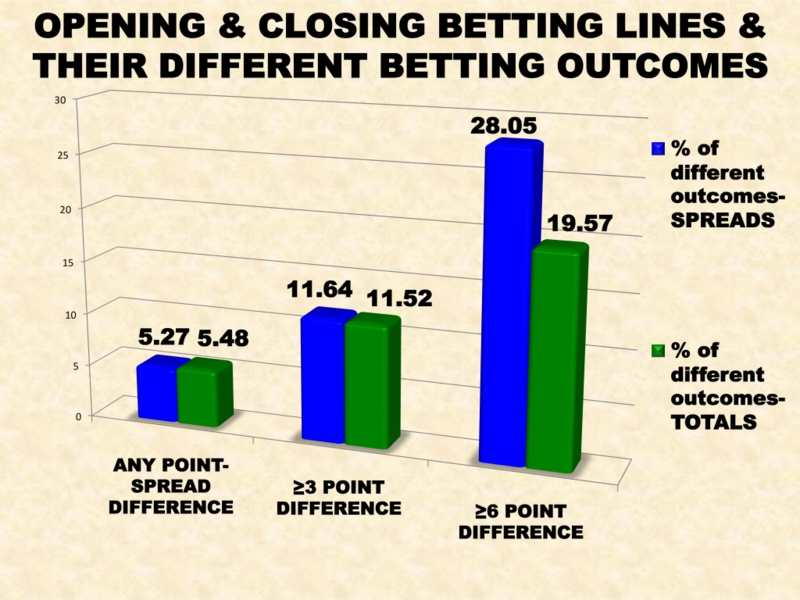 For point spreads, the opening betting line resulted in 9.02% more pushes than the closing betting line. For Totals, the opening betting line resulted in 16.48% more pushes than the closing line. We next queried which betting line fell within three points (a field goal) of the actual results. Again, for point spreads, the opening betting line fell within a field goal of the actual results 1.48% more often than the closing line did. Likewise for Totals, the opening betting line fell within a field goal of the actual results 3.11% more often than the closing line did. As we concluded in our previous article on efficient markets in sports betting, there are compelling reasons to believe the more inefficient (college football) betting market can be found utilizing the closing betting line. Based on our belief that behavioral economic principles apply to sports betting, we were not surprised to discover that the greater the difference between the opening and closing betting lines, the more likely it was that the betting outcomes differed. We attribute this phenomenon to the human tendency toward overreaction, and we believe we can use that understanding to continue to find value by waiting as long as possible to place (many of) our bets.